A friend, co-worker is pregnant with a baby boy. She and her spouse had decided, before they found the gender that if they had a boy, the baby's room will be the LA Lakers theme. Since this is their first child, I thought it would be fun to incorporate the LA Lakers theme with the first baby shower ever. Do you have any ideas on what we could do for decorations? Also, the shower is scheduled for this month at our work site. There will be approximately 20-30 people that will be able to attend during the lunch hour or so. An La Lakers baby shower sounds like lots of fun! Decorate the room with the team's colors (purple and gold). You can bring this into the room with streamers, balloons and tableware supplies (plates, napkins, plastic silverware). Use clusters of balloons around the room to add a splash of color. If the mom to be has a huge collection of Lakers memorabilia, see if you can borrow some (like teddy bears) to help with the decorating. An example with the teddy bears is to use them as table centerpieces. Add a cluster of balloons to each teddy bear and place on the tables for a colorful decoration. You can create a baby clothesline with cute la Laker baby outfits strung across the room or on a wall. You will need a clothesline rope and clothespins to attach the outfits. Outfits can be purchased online at the official Lakers Store or on Ebay. Another fun baby shower centerpiece that you could use is the diaper baby. 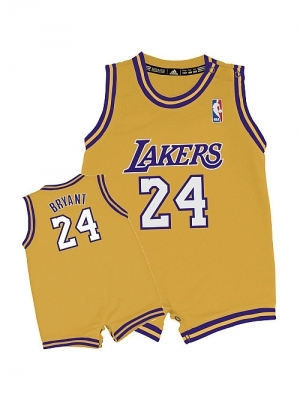 Since they love the La Lakers, you can create a baby out of diapers and dress it in a cute La Laker baby outfit. We have a really cute Harley baby in the photo gallery that was made for a couple who loved Harleys, and it was a big hit! The diaper baby is actually really easy to make and it definitely is something that would create a stir among the guests. Create invitations to look like a basketball game tickets. Provide food for your guests that they would see at a basketball game. Provide hot dogs, chips, dips, nacho sauce, and chicken wings buffet style for your guests to enjoy. A potato bar or nacho bar would also work nicely for a large group. You can get some additional ideas for the baby shower on our sports baby shower page. Good Luck With Your La Lakers Baby Shower!